Akamai has published their final ‘State of the Internet’ report for 2016 (Q4), which reveals that the global average fixed line broadband download speed is now 7Mbps (up 12% from 6.3Mbps in Q3) vs 16.3Mbps in the United Kingdom (up 10% from 14.9Mbps). 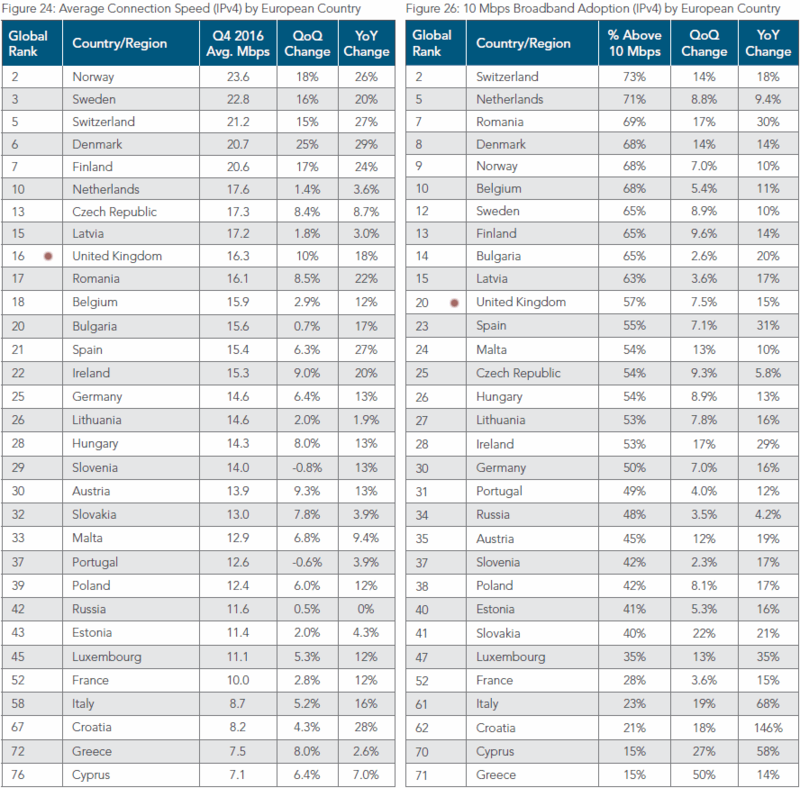 The UK’s country ranking also climbed to 16th. During the last report (Q3 2016) we were predicting that Spain, which was improving its Internet performance at a fairly rapid pace thanks to a strong roll-out of “ultrafast” FTTH/P connectivity, would overtake the UK by the end of the year but interestingly that hasn’t happened. In fact the UK seems to have experienced a seemingly abnormal performance jump of 10% during Q4, which has kept us well above the EU’s other four major states (Spain, Germany, Italy and France). We’ve seen similar jumps before and they often fall back in later reports, which may have more to do with how Akamai’s network operates than the reality on the ground (see further below). Separately we note that this report has also “removed the discussion and analysis” of Average Peak Connection Speeds, which is apparently due to “data issues that affected peak speed calculations this quarter.” As such we’ve instead chosen to focus on the % able to receive speeds of 10Mbps+ because that’s in keeping with the UK’s plan to introduce a 10Mbps Universal Service Obligation (USO). However we should point out that Akamai’s data is based on the performance of their global Content Delivery Network (this accounts for around 15-30% of all web traffic), which is an approach that often fails to accurately reflect actual end-user connection speeds. Never the less, when taken in the correct context, Akamai’s data can still be a useful gauge of global change. On top of that most fixed line broadband connections in the UK are still being delivered via slow ADSL lines (i.e. most people haven’t yet upgraded) and sadly Akamai’s data does not reflect network availability, which is important because “superfast broadband” (24Mbps+) connections are now estimated to cover around 92% of the country. It’s also worth highlighting that most of the fastest countries for broadband speed are not major economies (measured by GDP), although quite a few of the top ones do have strong coverage of ultrafast fibre optic (FTTP/H) networks. Naturally it may be more constructive to see how the UK compares against other countries in Europe, which at least places us in the top third and ahead of other major economies like Italy, France, Spain and Germany. However once again it’s the smaller states, particularly those with a lot of pure fibre optic cable in the ground (e.g. Sweden), that tend to hold the top spots. Mind you this may start to change during late 2017 as Virgin Media and Openreach (BT) continue to boost their top broadband speeds through new services and technologies (G.fast, FTTP, DOCSIS 3.0 / 3.1 etc.). Akamai’s report also includes a small slice of data on the 3G and 4G data performance of Mobile Network Operators (i.e. 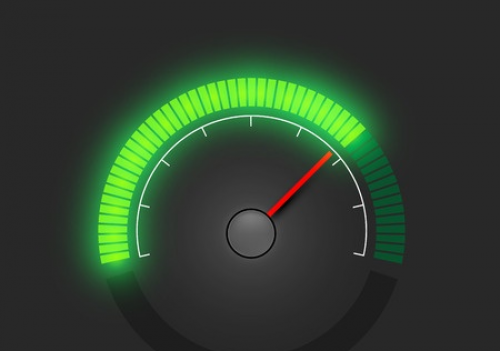 Mobile Broadband / 3G / 4G), which is one area where the United Kingdom tends to do better and indeed we’re still the fastest country in Europe, with average mobile connection speeds of 26.8Mbps (up from 23.7Mbps in Q3). However the reported mobile speeds should be taken with a pinch of salt because they can easily be impacted by the use of proxies (these exist within many mobile operators) and thus we consider the data to be unreliable. A perhaps more useful measure is to look at the data from speedtests collected by Ookla (here), which suggests that the UK’s average mobile download speed (24.63Mbps) ranks 32nd in the world and 22nd in Europe. On the other hand Ookla’s data is far from perfect and in the past we’ve questioned how their results are weighted (i.e. they tend to cut out a large chunk of the slowest speedtests). Alternatively OpenSignal recently reported that the UK ranked 26th fastest in the world for Mobile Broadband (3G / 4G) with an overall speed of 15.13Mbps (here). Suffice to say that we don’t cover Akamai’s Mobile Connectivity aspect much due to the potential for misleading results. Interesting to compare the 10Mbps (USO) values with yesterday’s report on TBB’s coverage figures. That one reckoned 96-97% of premises can get a 10Mbps+ connection with fixed line, whereas this article shows 57% actually achieving it. It very much shows the stark difference between service availability and people’s willingness to pay. I think it just highlights the fact that BT do not have the capacity installed in the FTTC system to supply 96-97% of premises. Also quite a few FTTC cabs have no power or fibre cable to them.